MHS senior Taylor Swartz (22) drives between a pair of Wellston defenders, during the Lady Marauders’ 65-21 victory on Thursday in Rocksprings, Ohio. Meigs sophomore Jerrica Smith passes from the top of the key, during Thursday’s TVC Ohio bout inside Larry R. Morrison Gymnasium in Rocksprings, Ohio. ROCKSPRINGS, Ohio — Sending the seniors out in style. 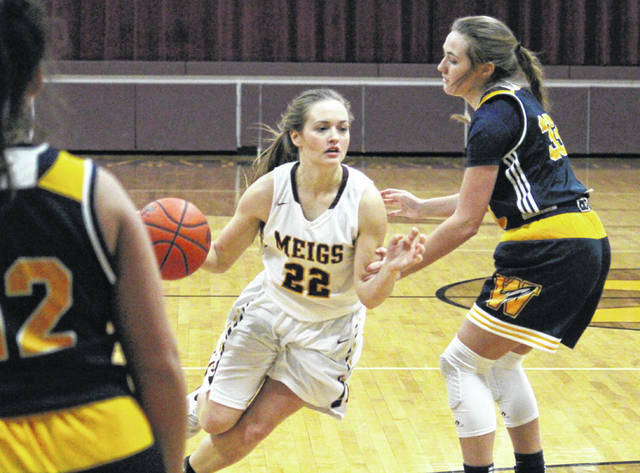 The Meigs girls basketball team celebrated senior night with a 65-21 victory over Tri-Valley Conference Ohio Division guest Wellston on Thursday, playing inside Larry R. Morrison Gymnasium for the final time this season. The Lady Rockets — which also fell to MHS by a 67-30 count on Dec. 17 in Jackson County — led initially in Thursday’s contest, with Sydney Mullins sinking a trifecta 18 seconds into play. Ten seconds later, Mullins went to the foul line and hit her second of two tries, giving her a 1,000 career points and the guests a 4-0 edge. 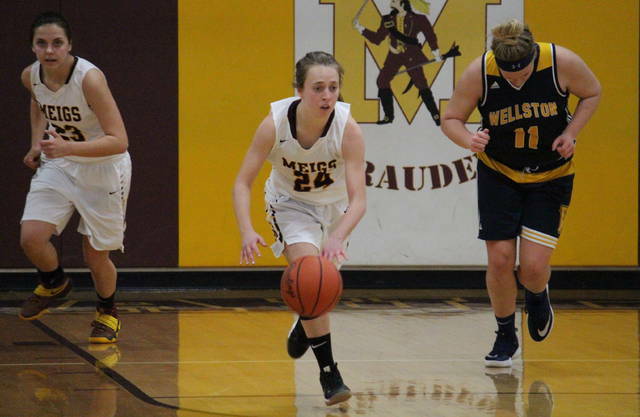 Meigs (12-8, 6-5 TVC Ohio) pulled within one point with 7:15 left in the first on a Madison Fields trifecta, and then took the lead for good, at 6-4, with a Marissa Noble three-pointer at the 4:20 mark. The hosts outscored WHS 4-to-2 over the remainder of the period and took a 10-6 lead into the second. The Lady Marauders scored the first five points of the second, before a three-pointer by the guests made the margin 15-9 with 5:30 left in the half. The Maroon and Gold rattled off 18 consecutive points over the next five minutes, and then the Lady Rockets hit a free throw to make the MHS lead 33-10 at halftime. 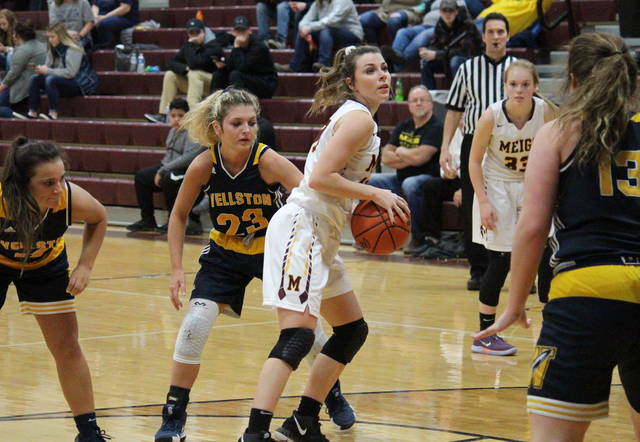 After forcing two dozen turnovers and collecting 17 steals in the first half, Meigs called off the pressure in the second half, but still outscored WHS by a 16-to-7 clip in the third period to make the margin 49-17 with eight minutes to play. The hosts pulled in 17 rebounds in the final quarter and sealed the 65-21 win with a 16-to-4 run. Following the triumph, third-year MHS head coach Jarrod Kasun commended his seven seniors, Kassidy Betzing, Kylee Blanks, Madison Fields, Marissa Noble, Becca Pullins, Alyssa Smith, and Taylor Swartz. The Lady Marauders hit 26-of-65 (40 percent) field goal attempts, including 10-of-32 (31.3 percent) three-pointers, while Wellston shot 7-of-53 (13.2 percent) from the field, including 2-of-16 (12.5 percent) from deep. At the free throw line, MHS was 3-of-7 (42.9 percent), while WHS was 5-of-9 (55.6 percent). 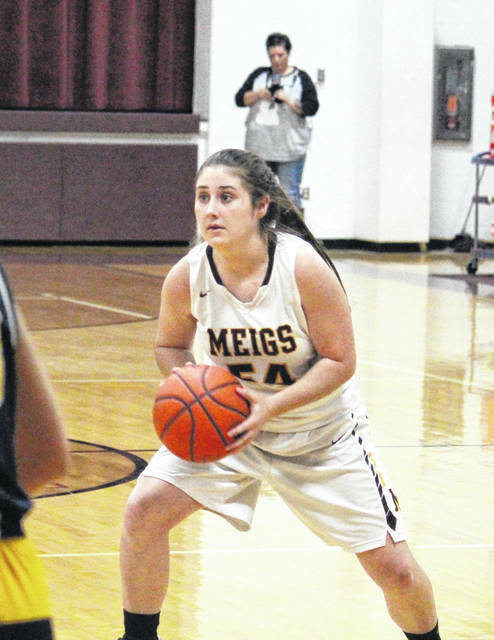 Meigs won the rebounding battle by a 40-to-36 tally, including 15-to-12 on the offensive end. The Lady Marauders committed 11 turnovers, 15 fewer than WHS, while earning 20 assists, 17 steals and six blocked shots. The Lady Rockets combined for eight steals, six assists and one rejection. Fields paced the Maroon and Gold with 14 points, consisting of one triple, five two-pointers, and one free throw. Kassidy Betzing was next with 13 points on six field goals, to go with seven rebounds and six assists, while Pullins hit a pair of three-pointers on her way to 10 points. Alyssa Smith and Mallory Hawley each scored nine points for the victors, with Smith making a game-best three trifectas, and Hawley grabbing seven rebounds. Noble tallied eight points, six from beyond the arc, while Jerrica Smith added two points to the winning tally. Hawley led the MHS defense with seven steals, followed by Pullins with three steals and three blocks. Mullins led the guests with seven points, followed by Emily Kisor with five points and eight rebounds. Tory Doles and Ashley Compston scored three points apiece, with Doles also grabbing eight boards. Jenna Johnston came up with two points in the setback, Emma Jadrnicek added one, while Mya Bouska had team-highs of four assists and six steals. With the final week of the regular season upcoming, beginning with a trip to Athens on Monday, Coach Kasun is hoping the Maroon and Gold can continue the high-quality play.